Congratulations to Greg Rucka, Steve Lieber, and the gang at Oni Press as the film adaptation of Whiteout releases today. I enjoyed the book, so this one is on my to-do list. 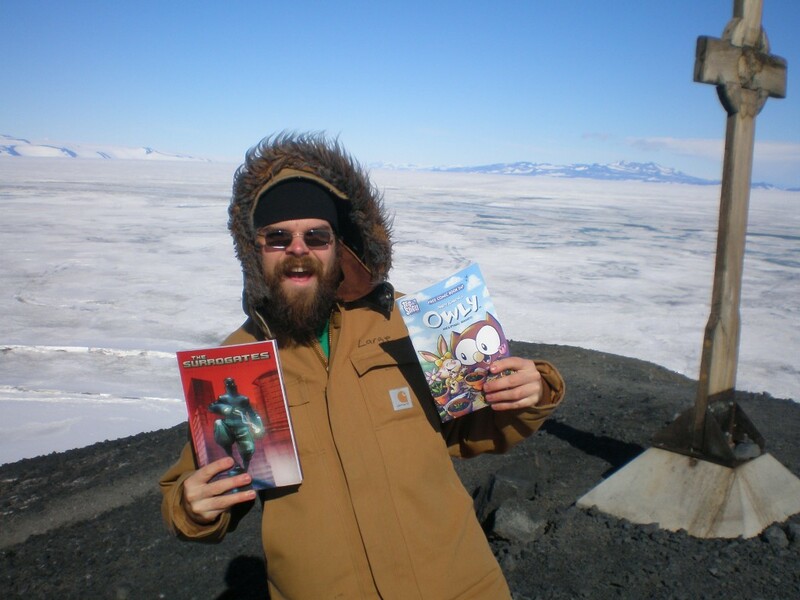 That’s Nate standing at Hut Point near McMurdo, holding up The Surrogates and a Free Comic Book Day edition of Andy Runton’s Owly (Andy is a good friend, and he lives only a few miles from me here in Atlanta, so it must be kismet that our books are in the shot together). Undoubtedly, this is as close to Antarctica as I’m ever likely to get. Regarded as one of the most dangerous and desolate places on the planet, I can’t help wondering what drove men like Shackleton, Amundsen, Scott, and others to explore that region of the world. It’s one sort of heroism to find yourself unexpectedly facing Mother Nature at her worst and persevere in spite of her, but it’s quite another to know in advance what hell she has in store for you and venture forth regardless. So I’d like to think it was ignorance that spurred them, that they never would’ve embarked on their expeditions had they known how truly perilous the ice was going to be. Then again, that could be pride talking because I’m reluctant to concede the glaringly obvious—they were made from far sterner stuff than I.